I agree. And this one is so well done, it feels like buying an instrument rather than buying another app. When I bought Samplr I thought I was buying just another app. How wrong was I! Yes, you must be humble to the top, Master! Moog Model 15 is hot hot hot! Can we celebrate it at ColdStone? Moog's treat! $30 per person! Cheap! $15000 total for 500 people, only 1 1/2 of real M15! I posted a link to an animoog site where the owner of the site said he was a beta tester of M15 and released a free album on bandcamp where all the tracks were created with M15 live. Listened to this and thought it sounded cool, but well... please don't take this wrong... but it all sounded kinda samey and got a little bit tedious to me. Don't get me wrong, the sound itself was cool, but grew a bit tiring. Then I went to the Moog Soundcloud feed and listened to all 13 of their demo tracks. There was still a bit of the sameness, ie. like music all created with the same instrument, but they managed to get more variety I think. And, it was therefore less tedious to listen to. Wondering if you REALLY have to know what you're doing to get to this level. So, my question for the early adopters here... are you finding it easy, or fairly difficult to wrangle vast variety of sounds from this app/instrument/synth? And, is this more the sort of instrument you'd likely use sparingly with other apps more? Or, is it more for exploring a wild universe of synthesis for inspiration and learning? Or, do you see it as more of an all-encompassing sonic synth orchestra of complete compositional possibility? Well, the future of sonic mayhem will be controlled by genetic algorithms and optimized by fuzzy logic, it is easy to do so for your curiosity by your command! The left over on the equation is your own inner artistic desire to realizatdion. It is up to you to pick your delight! I don't against you, but found you a good person! Take rest, lala! Is it 7.9 or 9.7? Take rest! Man, you guys all are really infectious with your love of this App. I really don't need it, and I never was into Modular at all, but reading all of this sends me through all the motions (I need to get this, as fast as possible / but I can't see it really contributing to my style of work / but I could spent some real quality time with it, just messing around and enjoying / but I might as well get a little more in touch with all the Apps crowding my Pads anyways / but I'm gonna missout out on all the joy everybody here experiences, also: this is state of the art, pushing the boundaries and taking things further on ios...(repeat ad infinitum)). Anyways, thanks everybody for the enthusiasm filling this thread, and thus enriching my days, it's a joy! I'm proud of myself. I know I will cave eventually, but have held out so far. Sounds like a quote from Professer Stanley J. Krammerhead III junior, a visiting professor of applied narcotics from the university of Please Yourself California - The Rutles. More seriously, I too have been listening to the demos, trying to work out why lots of people think it's great. Yes, the sound is superb, and the controls a beauty to behold. My initial impression was that this would be an incredible synth. But many synths I already have seem to produce a much more varied range of sounds. Is it me, or have more varied demos just not been made yet?. [...] But many synths I already have seem to produce a much more varied range of sounds. Is it me, or have more varied demos just not been made yet?. I felt the same way about Animoog at first. The stock presets definitely had an unmistakeable "Animoogy" sound. I don't have Model15 but I think it would be the same; it just takes time to tweak and customize things to really tap into and appreciate the breadth of possibilities. I think that part of the appeal of this app is that it is a specific emulation of a classic hardware synth. It doesn't promise to do everything, but merely to emulate the Model 15 very well. Synths like Thor, Tera Synth, and even Magellan have likely much more to offer as far as sonic possibilities. 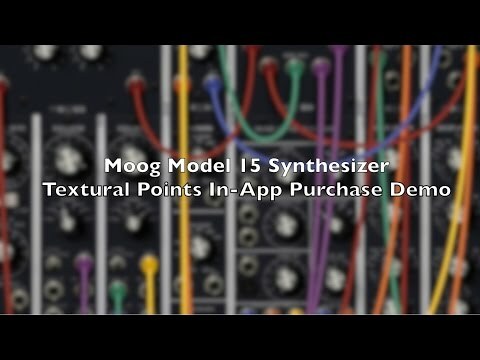 But, if you want the "classic" Moog sound (which Animoog never really pretended to be), this is probably the best app for that. Plus, in my mind, this interface is much more intuitive than those in Audulus or zMors Modular (which again, can do much more than this app can, due to the addition of more complex sequencers, math modules, etc.). I think at this point, as I mentioned in private, I'm mostly intrigued about this as a modular synth learning tool... with the Moog emulated sound a bonus. I know that sounds wacky to most of you, but I know almost nothing about modular synthesis at all, and this looks like a really fun learning tool. Going to stay in the backseat a while longer to see how all the early adopters make out and some reviews, but I'll eventually cave I'm sure. First come, first treat! Price will be raised! Animoog, 5-10 fold already, I guess! This synth is in a class of it's own. Moog have set the bar really high. I bet someone will build a full scale midi controller for this app. In fact I wish Moog had an official hardware midi controller. I wonder if it's something they'll now consider? Doug has his review up! For any of you guys like me, with an iPad Air 1, having crackled sound issues, in settings you can turn on Econo mode and something about IOS effects optimization. Not too sure but with those two things enabled, I can definitely run it better in AUM. How does it behave with Auria? Can it write MIDI to Auria's Piano roll? Will it run fine alongside multiple MIDI and audio tracks and plugins? P.S. : how does it compare with FF Twin 2? Oh no! There goes my resolve. Model 15 can send midi notes out, plus poly and channel pressure, velocity, knobs and switches, configurable and midi learnable cc's. IAA Transport panel is nice and foldable; very taxing on a mini2 w/ Auria (cpu overload message) without adjusting buffer size. If you look at other threads, how dreadful the ghost city on AB forum for the first time! Absolute sensation! Everybody got one to stay in home! Speechless! Good night. Do you know how to advertising yourself? The link failed! Ya, you got it back now!